If there is one guiding philosophy at BTE, it's this: Building a model airplane kit should be as enjoyable as flying it. I want our customers to want to build a second BTE kit even before they've flown the first. What makes a kit enjoyable to build? In a nutshell, quality. Good materials. Parts that fit without any fudging. Clear, understandable plans that would allow an experienced builder to proceed even without instructions. A complete instruction book that anticipates and answers all questions, explains design reasoning, and leaves nothing for the builder to guess at or engineer themselves. This is a kit that even fussy scratch builders will like. I know, because I'm basically a fussy scratch builder too. When cutting parts for myself, I try to be as accurate as possible so that they fit well the first time. It's a satisfying feeling that shouldn't be limited to fussy scratch builders. Kit builders that put down good money to purchase a BTE kit should be rewarded with parts that are just as good (and maybe better) than I would cut for myself. The major parts found in a BTE kit are machine-cut. They are actually sanded to their final shape using templates for accuracy that rivals laser-cutting, but without the charred edges. This takes a lot of time and effort on our part, but it results in smooth, square edges that make solid contact when assembled. Skilled modelers know that firm wood-to-wood joints are a must for maximum strength. Most modelers have built or have seen kits with the typical Lite-Ply fuselage that uses slots and tabs for assembly and alignment. To get the parts ready to use, first you have to push, pry, cut, snap, or break them out of their die-cut sheets. Then you usually have to sand the edges to get rid of rough spots, hoping that you don't change the shape too much. When you finally put them together, you find the slots are too small, or worse, too big. Sure, lots of very flyable models get built that way and lots of modelers don't mind because they're simply used to it. But there IS a better way. Now imagine opening a Venture 60 kit and seeing all of those lovely Lite-ply parts already precision cut, sanded, and ready to assemble. It's a snap! The tabs fit firmly into the slots, just the way they're supposed to. Instead of fixing, you're building! And the structure is solid and strong. The Venture 60 wing features such things as pre-shaped leading and trailing edges, spruce main spars, and shear webs that are precision cut in height and width. The airfoil is flat on the bottom from the main spar to the trailing edge, which makes it very easy to build on a flat table. The front of the airfoil is almost symmetrical, and it handles aerobatics like it has a symmetrical airfoil. The leading edge is fairly blunt which enhances its low speed flying characteristics. Torque rods are provided in the kit for aileron actuation with a single servo, but many builders have opted for separate servos in each wing. The tail surfaces are solid balsa parts that are sanded and ready to glue together. The elevator and ailerons are tapered for better streamlining and all of the control surfaces are pre-beveled along the hinge line. Why don't all kit manufacturers do that? When asked, "How long does it take to build? ", I just reply that chances are good you'll spend as much time covering the plane as you did building it, if not more! One builder jokingly complained because he bought a Venture 60 for his "winter project" and had it done in a week! Ground handling is precise and easy with the Venture 60. I recommend it highly for anyone looking for their first taildragger model. The aluminum landing gear legs are swept back for the simple purpose of proper wheel placement. Bolting the gear to the fuselage makes sense from a structural standpoint, but it tends to place the main wheels too far forward of their ideal position. The result? Bouncy landings! Trust me, you can still bounce the Venture, but sweeping the gear back minimizes that tendency. It looks nice, too. To finish the model, you'll need an engine, radio, 16 oz. fuel tank, fuel line, an engine mount, two 3" wheels, a 1" tailwheel, three rolls of covering material, a pilot figure if you wish, and common modeling tools. You can order many of these items from BTE right along with your kit. An optional wheel pant kit is also available. To me, the model just doesn't look right without the pants and they're plenty tough even if you fly from grass. I know that modelers love to over-power their airplanes, but that's simply not necessary (or recommended) for the Venture 60. This is a sport model designed for sport .60-size engines. At the design weight of 7.25 pounds, most sport .60s will pull the Venture straight up as far as you want to go. To me, reliability is much more important than raw power. A lot of my flying is done at reduced power to fully explore and appreciate the wonderful low-speed ability of the Venture. You can't do quarter-throttle inverted passes over the runway with an engine that might flame out. Stick to the recommended engine range, get a reliable idle, and you'll be able to fully enjoy the airplane. The Venture 60 flies the way I like to fly. With a fairly low-pitch prop it chugs its way through big, graceful maneuvers at mild speeds. Using its massive wing to grip the air, the Venture does things that heavier ships just can't. When the mood strikes, throw in a combination snap or a spin. With generous control throws it'll flat spin like a falling leaf and fly knife-edge as long as you can. Some customers have bought the kit with the intent of using it as their first pattern ship. Good choice! Slow down a bit and it will float in for some of the softest, slowest landings you've ever witnessed (which is another reason to work on getting a good idle). Want a second opinion? 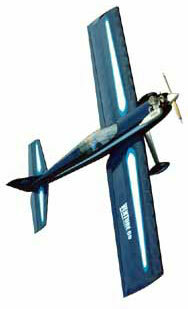 R/C Report magazine reviewed the Venture 60 in the May '95 issue (it even made the cover!). Keep in mind that most modelers agree that R/C Report really tells it like it is. The reviewer wrote "The Venture 60 kit is, by far, one of the most impressive kits I've ever assembled! Every aspect of the kit - the quality of the materials, the cutting and preparation of the pieces, the plans, and the instructions - just might be the best I've seen in any kit I've built." Wow. Thank You. And life? Well, life is just too darn short! Don't spend it working on a frustrating kit that just won't go together right. Treat yourself to a BTE Venture 60 and find out how enjoyable, relaxing, and satisfying this hobby can really be.